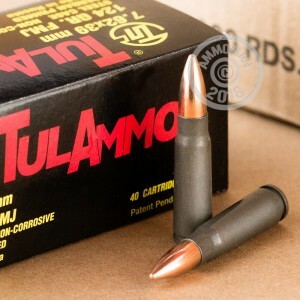 This is 7.62X39mm ammunition from Tula Cartridge Works. These cartridges feature 124 grain full metal jacket projectiles that fire at a muzzle velocity of about 2330 feet per second. Tula provides a very economical option that can be used for any type of range training and will feed reliably into any firearm of this caliber. This ammo is non-corrosive, non-reloadable, berdan primed, and cased in steel. 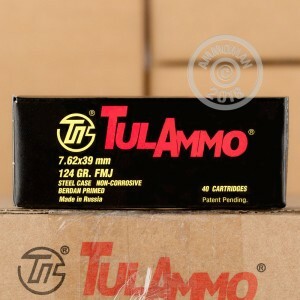 Tula Cartridge Works has been manufacturing quality ammunition since 1880. Their ammo is produced about 100 miles outside of Moscow and is currently the largest producer of ammo in Russia. Grab this case for your next range session and receive Free Shipping from AmmoMan.com! Great ammo, runs flawlessly in my AK. Not much to say about the ammo, other than it is what I have always expected from Russian ammunition. My rifles love it. That said, I have always been pleased with Ammoman's services; Product availability, competitive pricing, and fast delivery. God bless and be safe. Must of the rounds fired ok but had a few duds and split cases and those kinda worried me. This is a very good product for the money spent. 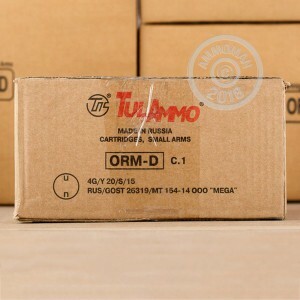 This ammo is very good range ammo the best price I could find anywhere keep up the great deals ammoman. Ordered on a Friday got on the following Tuesday. Free shipping. 1000 rounds of ammo. Happy happy joy joy! Shoots well and feeds well. Have 2 AKMs. Hope to order more soon. I test fired 30 rounds through a tapco polymer clip in a CAI Yugo M70AB2 and another 30 rounds through a eastern bloc metal clip in a CAI WASR-10/63. Both fed flawlessly and ammo was accurate. I would definitely recommend. This ammo worked well in my Ruger Mini 30 that had a Wolf extra-heavy hammer spring, but not in my AR15. I had light strikes and no "bang". Following advice I found on YouTube I lengthened the firing pin by grinding down the face of the collar by 0.007" thus increasing the depth of strike. After that, no problems. This procedure also solved the same problem with Hornady Zombie and SST steel-cased ammo. No problems feeding, no jams. Kind of dirty. First time ordering thru Ammoman, no hassles and and shipped next day. Great range ammo, no problems with several hundred rounds fired. I will definitely be using this again. I always get great ammo but this one tops them all, you out did yourself on this batch. Really great stuff the best I've ever gotten, And if you check my records you see I buy a lot. I love to shoot.